On a rainy day in May, a Carroll County resident was driving down busy Highway 5 when she spotted a heartbreaking sight. A deceased grey fox lay in the road, the likely victim of an automobile accident. Curled up in a fur ball beside the fox was a single fox kit. The kit was tiny, weighing about one pound. It was lucky to be alive! She took the baby kit to the nearest veterinary hospital for help. Connor of Douglasville, a veterinary technician at the hospital, knew just what to do: he brought the fox to AWARE. 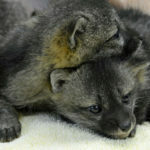 The kit joined several other orphaned grey foxes in our care. After 5 months of treatment, all the foxes were successfully released back to the wild where they can run free and live out their lives in their natural habitat. Ten years ago, before AWARE opened its doors, very few options existed to help orphans like this grey fox. Thanks to the efforts of AWARE’s founder, the late Michael Ellis, AWARE now prospers in his dream to provide care for Georgia’s native wildlife. What would Michael see if he were still with us? A center that has become Georgia’s largest rehabilitation facility where more than 10,000 animals have been helped. He would be thrilled and inspired to see that AWARE’s life-saving work is supported by people like you who care for wildlife and have agreed to peacefully coexist with wildlife. Donate to AWARE today and give the gift of life to a wild animal! Will you join us to celebrate Michael’s legacy and AWARE’s 10th anniversary with a gift of life to a wild animal? Your gift will help lay the foundation for AWARE’s next 10 years. Please make your 100% tax deductible donation today! Thank you for caring about Georgia’s native wildlife!